Fairhurst were initially commissioned to produce a design for rock slope remedial works on the approach slopes to Moncrieffe Tunnel. In January 2015, prior to commencement of the Form 001 process a soil slope failure occurred on the Down side, caused by poor surface water management in the third party field at the crest, which resulted in a line speed restriction being implemented. Fairhurst were subsequently commissioned to inspect the failure and design emergency soil slope remediation. An investigation of the remainder of the steep soil slope leading to the tunnel portal highlighted that additional remedial works were required. Fairhurst provided immediate response to the incident with site attendance and permanent soil slope remediation design. This required inspection of third party drainage and investigation which revealed that blockage of a third party culvert had caused extensive flooding of the field at the crest. This was demonstrated as a driving factor in the soil slope failure. The design comprised dig out of the saturated failed material, replacement with coarse stone and improvements to crest line drainage. Following completion of the emergency works, Fairhurst carried out analysis of the adjacent section of soil slope using ground investigation information and Rocscience SLIDE © slope stability software. This demonstrated the slopes to be marginally stable and highlighted the requirement for additional remedial works. 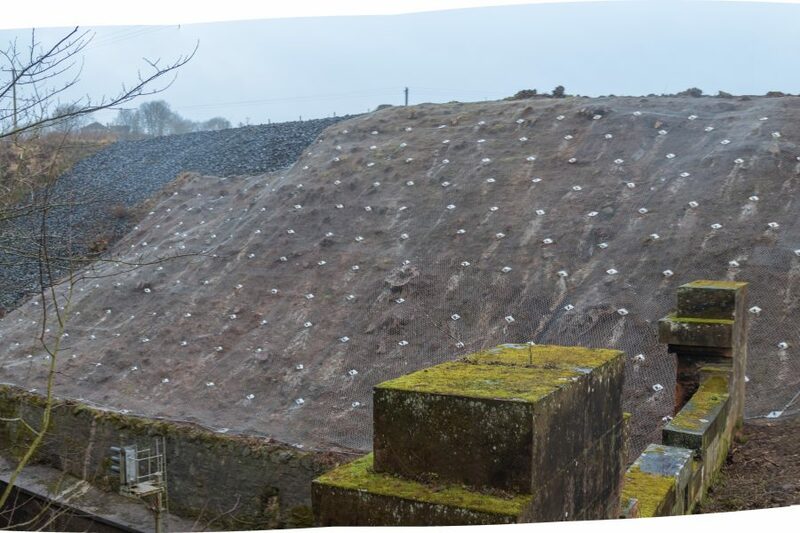 The most cost effective solution for this area was soil nails as all works could be carried out during dayshift with the line open and without the requirement for an isolation of third party overhead cables. Fairhurst carried out design of temporary works comprising both anchors for the soil nail rig and lightweight catchfence which eliminated the risk of personnel and equipment falling towards the open line.